It 's not like I need a reason to make brownies, but Myriam's invitation to her Browniebabe of the Month event, prompted me to try my hand at a very much lusted after recipe: Ina Garten's Outrageous Brownies. The thing is that I make brownies every other day or so, if not they are definitely in th menu on sundays...why? They are easy to keep around of a friend stops by, if the neighbors' kids are outside playing , see me and run toward my shopping bags asking "are you baking us something? ", and let's be honest because B. and I have a huge sweet tooth when it comes to brownies. After many years of brownie baking I have adapted and combined many different recipes to come up with one that turns plain chocolate into a square of deep dark fudge, and allows me to play with additions if flavors, liqueurs, nuts, dried fruits, etc....but to me the recipe is not original anymore as I make it so often. I will write it here someday but for the event I started dreaming about Ina's brownies (allright, Lisa, get your mind out of the gutter...). Why "revisited"? Well, for starters there was no way I was going to use 1 pound of butter! Why? There are ways to have outrageously good brownie without an artery blockage. But I still wanted an "outrageous" factor so I decided use diced salted butter chocolate caramels as an add-in and cut the recipe in half. If you don't want to go through the troubles of making the caramels, you could use diced soft caramels or crushed hard ones. Preheat oven to 350 degrees F. Grease and flour a 9 x13 baking pan. Melt together the butter, 8 oz semisweet chocolate chips, and unsweetened chocolate in a saucepan over low heat. Cool slightly. Stir together the eggs, instant coffee, vanilla and sugar. Stir in the warm chocolate mixture and cool to room temperature. Stir together 1/2 cup of the flour, baking powder and salt. Add to cooled chocolate mixture. Toss the caramles and 6 ounces of chocolate chips with 2 Tbs. flour to coat. Then add to the chocolate batter. Pour into prepared pan. Bake for about 30 minutes, or until tester just comes out clean. Halfway through the baking, rap the pan against the oven shelf to allow air to escape from between the pan and the brownie dough. Cool thoroughly, refrigerate well and cut into squares. Want to know the truth? They are so good, they made me wish I had made the entire recipe...! Fudgey, fudgey and again fudgey and they disappear faster then the neighbors' kids can "what did you bake today?" So if you were ever tempted to make them , run to your kitchen and make a full batch! You won't regret it. Wow these look delicious Helene. I sooooo need chocolate right now. I love the picture and the brownies...Waouuuuu!! So chocoloty. You can definitely trust Ina Garten when it comes to Brownies. She is my favorite. I wish she was my neighbour. And now I wish YOU were my neighbour. Wow you're so talented for presentation and pictures! Where is it you find those cute papers? Your picture is so beautiful! They look really wonderful. 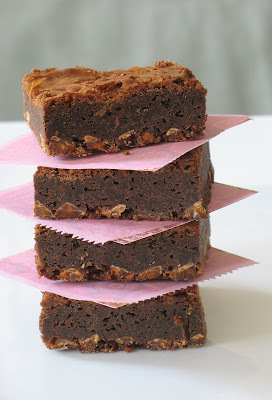 I have these brownies on my list to try, but I think it's the quantity of butter that has stopped me (so far)as well! 1 pound of butter? - this has got to be one of ina's recipes. thank you for joining. they look wonderful! These look and sound AMAZING - AS ALWAYS! Ohhh the ooey gooey salted caramels sound perfect for a brownie! Way to go, sweetie! Golly ... salted butter chocolate caramels ... yes I think that would push it over the top! I think it sounds like great fun to be asked "are you baking us something?" Yes, I love brownies and haven't forgotten I must bake some with Emily the next time we're with Jason. I'll keep these in mind. Oh Helene, fudgy brownies are my favourite! I LOVE the idea of the salted butter chocolate caramels in there - these would be so delectable! Lovely work changing the recipe up to be a better fit for you! That is just too much lovely chocolate for my eyes. I'm drooling. Wow, those caramels would be FANTASTIC in brownies! your brownies looks very, very yummy...i could eat one now! Helen u have managed to do it again....i just came back to tell u that i cant get my mind off brownies and i need to have some now.....argggg , u wicked person !!!! Thank you for this delicious recipe. This will be the next brownie I'm going to bake. It looks (and sounds) soooo gooood. hey tried the brownies, they tasted awesome!